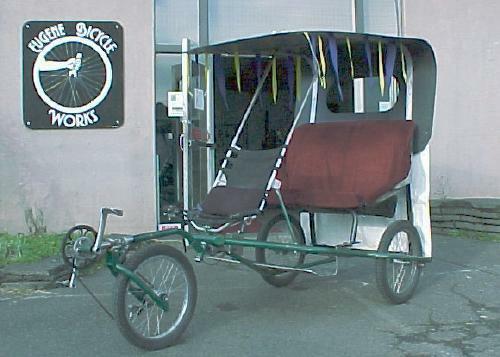 A reikshaw with Flevo-trike steering principle. To the driver it is just like riding a tandem. The passenger doesn't pedal. 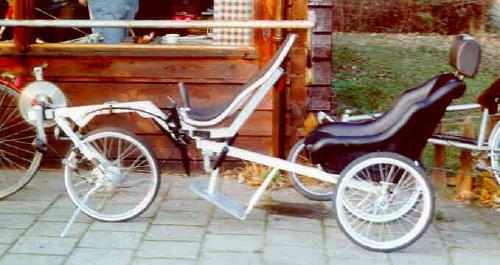 This trike has been custom designed for a father who could take his handicapped son this way. Because the back-part does not tilt, the passenger will feel rather some sideways forces. It has an arm-chair with much side-support, and a foot support. Because there is much pressure on the front wheel, it is possible to climb pretty steep hills, in spite of the fact that only one person is pedaling. A prototype of a reikshaw version of the TriHauler. Suitable for two adult passengers. As distinct from the FlevoTrike, the seat cannot tilt.